Using internet frequently without proper security measures can be harmful and you could cause severe problems like Spyware, other malicious and other viruses. These threats will be anywhere in your computer, silently stealing your personal information without letting you know or crash your operating system like Windows and you’ll end up losing all your data. Therefore, Microsoft has taken an initiative and they have released many free anti-spyware and anti-virus for the safety of Microsoft Windows users. Microsoft Security Essentials (MSE) is one of latest introduction. Microsoft Security Essentials is very efficient in protecting your comp from core malware that is introduced by Microsoft Enterprise Solutions. The Anti-Malware Engine introduced by Microsoft Security Essentials is tested regularly by various organizations globally and has been certified by several industries’ independent certification authorities like West Coast Labs, AV-Test, VB100 and International Computer Security Association Labs. 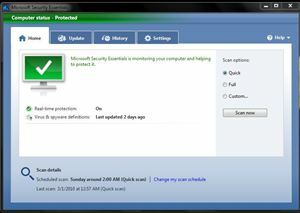 The advanced scanning and improved technologies of removing malware are the main characteristics of the Microsoft Security Essentials. Threats of viruses and malwares are common issues faced by over 600 million computers globally every month, and they are successfully diagnosed and removed by the Microsoft Malware Protection Center.